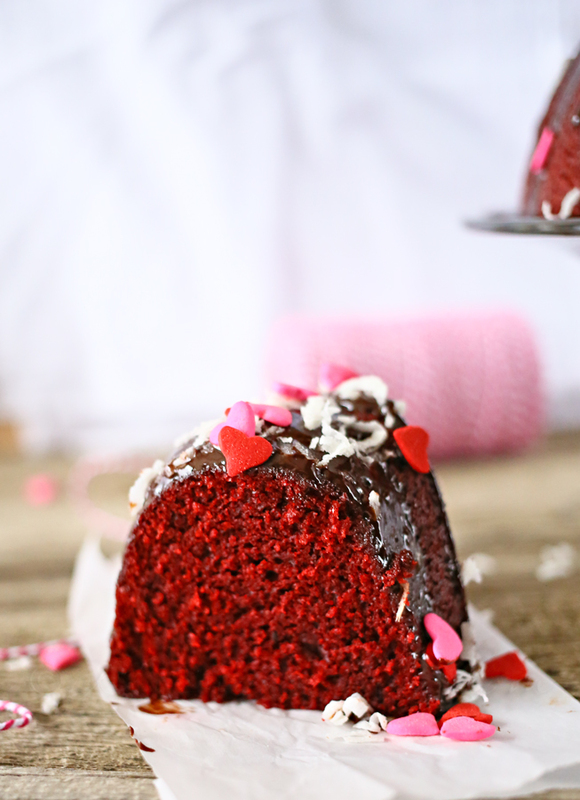 Red Velvet Bundt Cake with Kahlua Ganache is the perfect red velvet cake recipe for your Valentine’s Day. This is sure to bring big smiles from your sweetie this holiday. 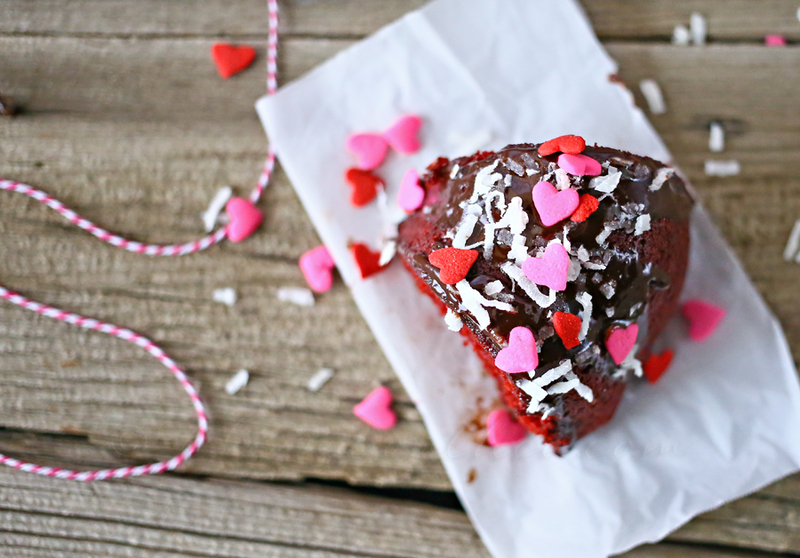 Have you had enough red velvet yet? No- me neither??? I was going through all the boxes of cake pans I shipped home from my mom’s house & really wanted to make a cake with one of them. I only had one bundt pan prior the arrival of the boxes so I was itching to try out one of her pans to see if I would have a better result. 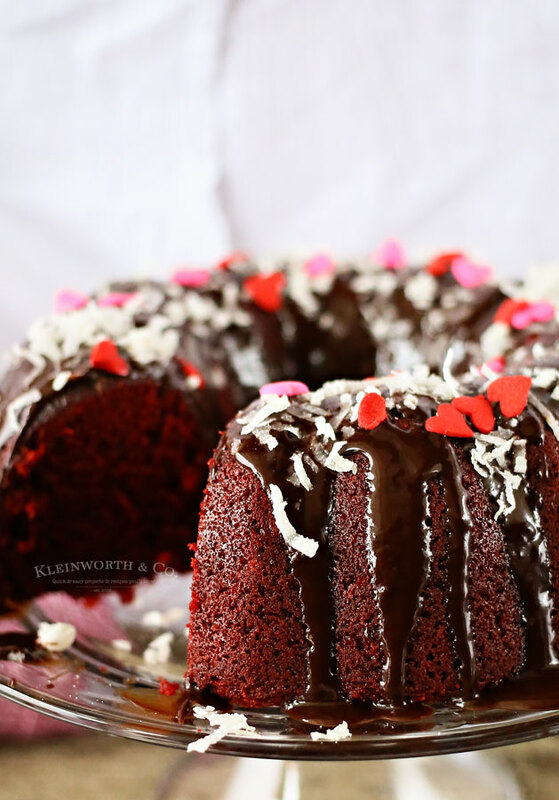 This Red Velvet Bundt Cake w/ Kahlua Ganache turned out delicious! 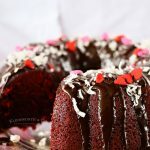 Since it is inching closer to Valentine’s Day I had to make a Red Velvet Bundt & then I decided to top it with a Chocolate Ganache instead of cream cheese frosting. But not just any chocolate ganache would do. I decided to give it a little extra love & create something special. I had to add a little coconut & sprinkles on top. If you can- just let that ganache just drizzle & drip all over the place. Not too much- but this was the perfect amount without overwhelming the flavor of the cake. In mixer bowl - beat together oil, buttermilk, eggs, food color, vinegar & vanilla. Add in flour, sugar, baking soda & cocoa. Beat on medium until fully combined. Pour batter into prepared pan & bake 45-60 minutes or until toothpick test is clean. Allow to cool on wire rack before removing from pan. Once cool- invert onto plate & make your ganache. Top with sprinkles & coconut. Place all ingredients in medium saucepan & heat on medium. 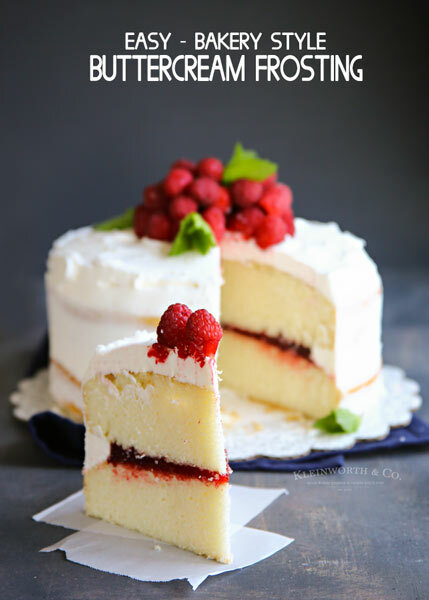 Remove from heat & immediately drizzle over your cake. Store remaining ganache in airtight container in refrigerator for up to 1 week. i love red velvet anything. it looks great! Good golly – does that look good. 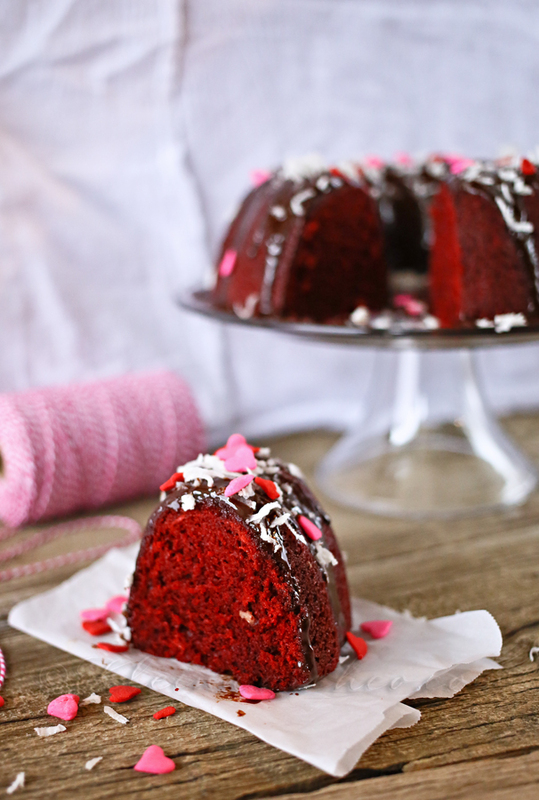 Oh goodness, this RED cake look luscious!!! Thank you so much for the récipe! Enjoy your weekend. 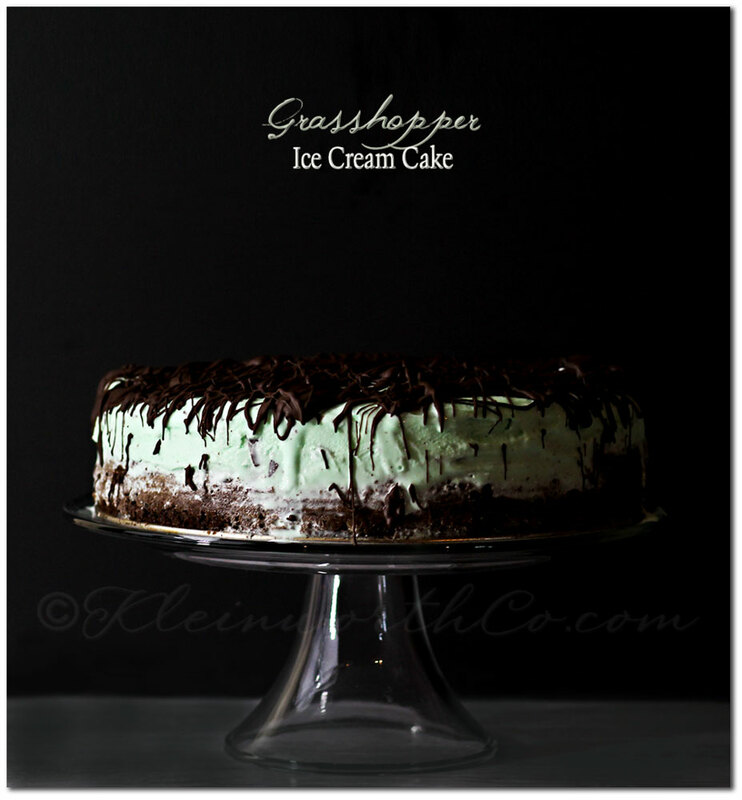 Oh my gosh, this sounds amazingly decadent and delicious! 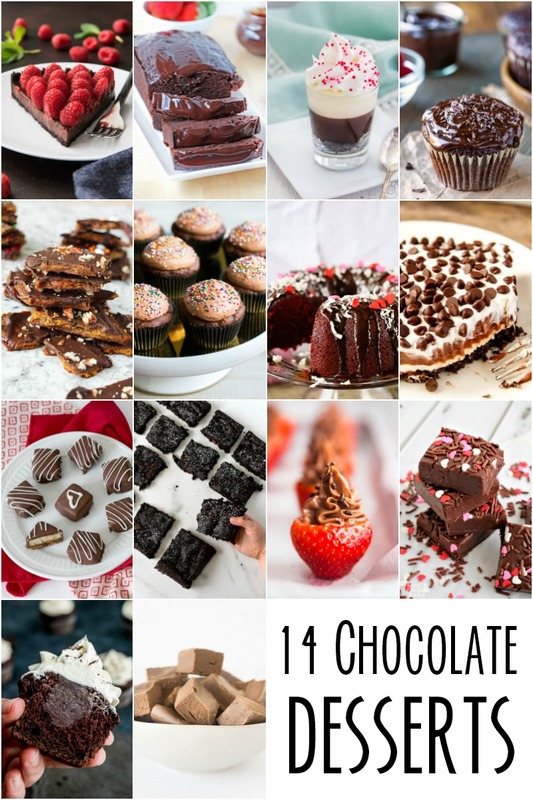 Pinning, and I featured this today on my blog! 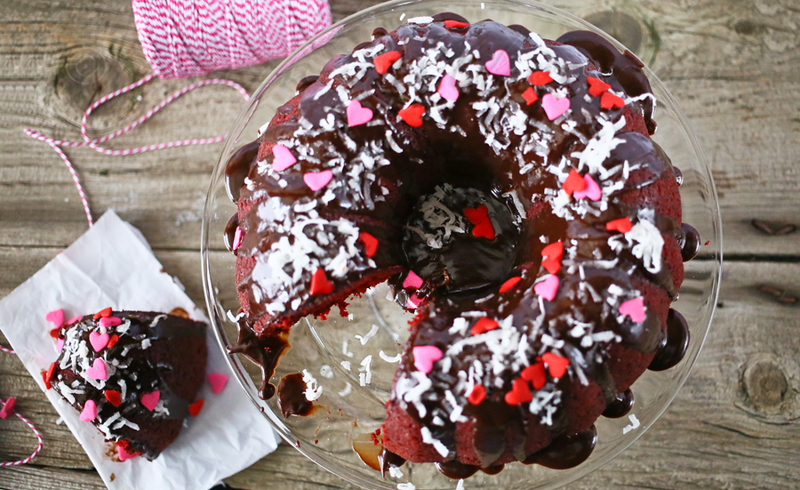 I just love a good bundt cake with some alcohol added in! 😉 It looks wonderful Gina. Thank you so much for sharing with us at Best of the Weekend. Pinned to our party board!! Oh my goodness! Another to DIE for dessert! 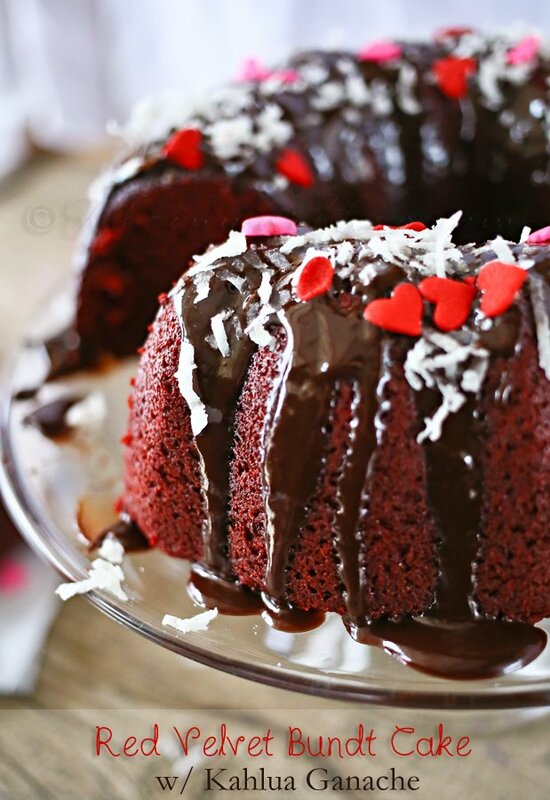 The kahlua ganache sounds amazing with the red velvet cake!! Thank you for sharing it with us at Sewlicious Home Decor! Pinned! 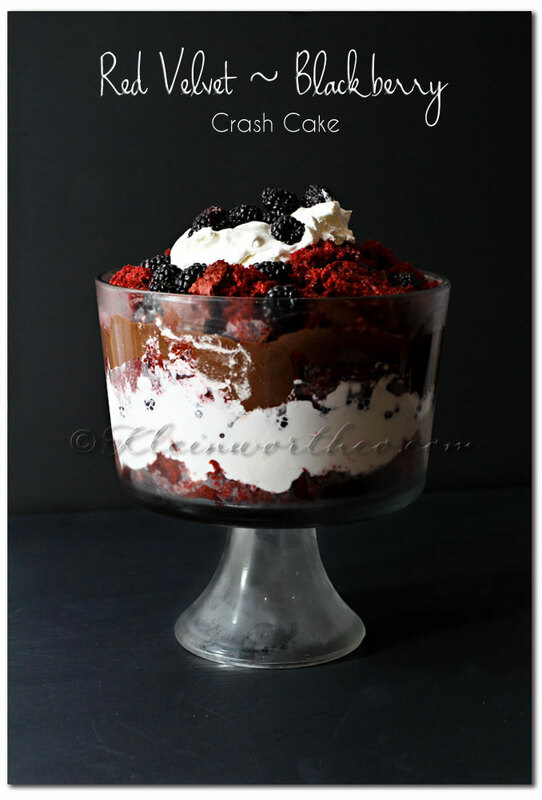 Oh wow – that looks so decadent!